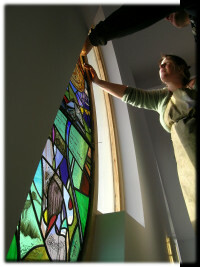 Foley Stained Glass is a family run stained glass studio situated amongst the Lowther Hills in Scotland’s Southern Uplands. Fiona Foley has been a practising stained glass artist since graduating from The Glasgow School of Art in the early 1990’s. With a long list of commissioning clients, Fiona has a reputation for sophisticated contemporary design whilst using the age-old methods and materials of traditional stained and leaded glass. 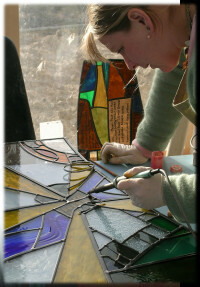 She has recently been honnored with the Pearson's Prize "Best use of Stained Glass" for her work in Shetland. Fiona has a particular aptitude for educationally orientated projects with many school commissions to her name and a strong ethic for sharing skills through related teaching and stained glass workshops. Andrew Foley is an award-winning Illustrator. His draughtsmanship and painterly skills have enhanced many of their commissions particularly their ecclesiastical commissions. Foley Stained Glass is available to commission on a wide variety of projects from large architectural installations to more intimate domestic panels. You are encouraged to contact us should you wish to discuss a prospective commission and we look forward to fulfilling your brief and delivering unique and beautiful stained glass for your chosen site.